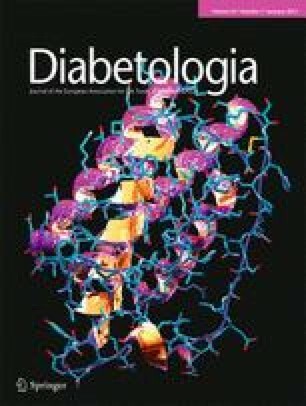 In type 2 diabetic patients, insulin detemir (B29Lys(ε-tetradecanoyl),desB30 human insulin) induces less weight gain than NPH insulin. Due to the proposed reduction of tubular action by insulin detemir, type 2 diabetic patients should have increased urinary sodium excretion, thereby reducing extracellular volume and body weight when changed from NPH insulin to insulin detemir. In a randomised, open-labelled, two-way crossover study of 24 patients with type 2 diabetes, patients were first treated with NPH insulin or insulin detemir for 8 weeks. Thereafter, they were changed to the other insulin for 8 weeks. In a third 1 week period, they were changed back to the first insulin. At the end of 8 weeks, body weight was reduced by 0.8 ± 0.2 kg (mean ± SEM) on insulin detemir compared with NPH insulin (p < 0.01). After insulin detemir treatment, we also observed a significant reduction of lean body mass (0.8 ± 0.2 kg, p < 0.05) and a non-significant reduction of extracellular volume (0.8 ± 0.5 l/1.73 m2, p = 0.14). The weight loss occurred after as early as 1 week (0.8 ± 0.2 kg, p < 0.001), with a simultaneous and transient increase of urinary sodium excretion (p = 0.07). Insulin detemir induces significant and sustained weight loss, which is first observed at 1 week after changing from NPH insulin. The initial weight loss seems to be related to changes in fluid volume and may reflect changed insulin action in the kidneys. The study was funded by a Libra Grant from NovoNordisk, DK. Insulin detemir (B29Lys(ε-tetradecanoyl),desB30 human insulin) is a long-acting insulin analogue. Possibly due to its more stable, protracted absorption from the subcutaneous tissue, insulin detemir has been found to have a reduced risk of hypoglycaemia compared with NPH insulin [1, 2]. However, the most constant finding in several studies has been the non-induction of weight gain by insulin detemir, in contrast to other insulins [1, 2]. However, the mechanism underlying this weight advantage of insulin detemir relative to NPH insulin is not fully understood. Different mechanisms, such as (1) less snacking by patients due to a reduced fear of hypoglycaemia, (2) a more physiological role of insulin detemir in the liver or (3) stimulation of satiety centres in the hypothalamus have been proposed [3, 4]. Previous studies have shown that the antinatriuretic effects of insulin are most likely to be explained by increased tubular re-absorption of sodium  and that, cross-sectionally, there is a central role for sodium in the pathogenesis of blood pressure changes in diabetic patients . The main site of insulin action in the kidney is the distal tubules. In acute insulin clamp and sodium infusion studies in humans, Skott and Stenvinkel showed increased fractional sodium re-absorption during hyperinsulinaemia [7, 8]. Due to the albumin-binding and hypothetically reduced glomerular filtration of insulin detemir, it can be hypothesised that tubular sodium re-absorption during insulin detemir treatment is reduced. To test the hypothesis that urinary sodium excretion is increased, and body weight and extracellular volume are reduced by insulin detemir, we compared the effects of insulin detemir and NPH insulin on the following predefined endpoints: body weight, extracellular fluid volume, sodium and water homeostasis, and body composition. We recruited 27 type 2 diabetic patients from the outpatient clinic at the Department of Endocrinology, Rigshospitalet; all patients were being treated with NPH insulin. Type 2 diabetes was defined according to the 1999 WHO criteria . All patients had HbA1c below 10% (86 mmol/mol) and normal urinary albumin excretion (i.e. <30 mg per 24 h). Exclusion criteria were any renal disease (serum creatinine >130 μmol/l), anaemia, uncontrolled hypertension (systolic blood pressure >180 mmHg and/or diastolic blood pressure >95 mmHg), pregnancy or use of loop diuretics. In the study group, 18 patients were taking an ACE inhibitor or an angiotensin II receptor antagonist, 12 of whom were also taking a thiazide diuretic. No changes were made in the doses of antihypertensive drugs during the study. The protocol was approved by the Danish Medicine Agency and local ethics committee. The study was performed in accordance with the principles of the Declaration of Helsinki and written informed consent was obtained from each individual. After screening the patients continued their usual insulin treatment until, within 4 weeks, they were randomly assigned to two groups for a crossover study. Each patient then received NPH insulin or insulin detemir for 8 weeks. Subsequently, each patient switched to the other insulin treatment for 8 weeks. For a final 1 week period patients were again treated with the insulin used in the first period. The patients were instructed to perform four-point blood glucose profiles weekly during the study. In the last week of each treatment period and on days 3 and 5 in the 1st week after treatment change, the patients collected 24 h urine samples at home. In the same weeks, the patients twice conducted 24 h blood pressure measurements at home (90217 Ultralite Monitor; Spacelabs Healthcare, Medidane, Nærum, Denmark), namely on days 2 and 4. Blood for laboratory measurements was collected from the antecubital vein without stasis. Thereafter, body composition was measured by dual energy X-ray absorptiometry (DEXA) whole-body scanner (Lunar Prodigy, GE Healthcare, Chalfont St Giles, UK). Total lean body mass and fat mass were measured. The GFR and plasma volume were measured over a period of 4 h by measuring the disappearance of 51Cr-labelled EDTA from plasma after a single intravenous injection of EDTA. Body weight was recorded with the same scales (MT32 type M5; Bisco scales, Farum, Denmark) for each patient (without coat and shoes) in the fasting state. Urinary sodium excretion rate was calculated as U Na × V, where U is units and V is volume, and expressed as mmol/l. HbA1c was measured by a chromatographic technique (Tosoh, Tokio, Japan). Blood glucose was measured at home with an Ascensia Contour (Bayer Healthcare, Leverkusen, Germany). Urinary albumin concentration was measured by an immunoturbidimetric assay (Roche, Hvidovre, Denmark). Plasma N terminal-pro brain natriuretic peptide (NT-proBNP) was measured with a sandwich electrochemiluminescence immunoassay (Roche, Hvidovre, Denmark). The bioactive renin concentration was measured by a high-sensitivity plasma renin activity assay (Glostrup Hospital, Glostrup, Denmark) and aldosterone was measured using a commercial kit (Coat-a-Count, catalogue item TKAL; Diagnostic Products, Los Angeles, CA, USA). The results are expressed as means and SD when values were normally distributed, and as medians and interquartile ranges when the values were not normally distributed. Paired Student’s t tests were used when the values were normally distributed; otherwise, Wilcoxon’s tests for paired differences were used. A two-tailed value of p < 0.05 was considered to indicate statistical significance. Of the 27 patients recruited to the study, 24 completed both trial periods. Of the non-completers, one patient developed itching red skin reactions to insulin detemir at the injection site. In another patient blood glucose increased substantially despite increasing the dose of insulin detemir and the third non-completer stopped due to lack of compliance. Clinical characteristics of the 24 patients were: age 62 ± 9 years, body weight 93.1 ± 15.1 kg and HbA1c 7.6 ± 1.2% (59 ± 10 mmol/mol) (all values given as mean ± SD). Compared with NPH insulin treatment, insulin detemir treatment resulted in a significant reduction in body weight after 8 weeks (p < 0.05) (Table 1). At the same time, after insulin detemir treatment, a significant reduction of lean body mass (0.8 kg, p < 0.05) (Table 1) and a non-significant reduction of extracellular volume were demonstrated (Table 1). No difference in total fat mass was seen after the two treatment periods. Body weight was reduced after as early as 1 week of treatment with insulin detemir (p < 0.05) (Fig. 1 and Table 2), with all but two patients having reduced their body weight by this time-point. Urinary sodium excretion was temporarily higher, although not statistically significant, at day 3 after changing from NPH insulin to insulin detemir and similar during both treatments after 5 days. GFR was not different after the two treatment periods. No differences were seen between 24 h blood pressure profiles measured at home on day 2 or day 4 (Table 2) after treatment change, or after 8 weeks on the two treatments (Table 1). Plasma aldosterone, NT-proBNP and active renin were all similar after the two treatment periods (Table 1). In the first week of the two treatments, the mean blood glucose, based on daily four-point preprandial blood glucose measurements, was similar (Table 2). During the following weeks the mean preprandial blood glucose was 0.6 to 1.2 mmol/l higher during insulin detemir treatment compared with NPH insulin. This corresponded to a slight increase in HbA1c, and occurred despite increasing the mean dose of insulin in the insulin detemir group from 55 to 65 U/day. The major finding in the present study was the reduction of body weight after 1 and 8 weeks during treatment with insulin detemir in type 2 diabetic patients with normal urinary albumin excretion, compared with patients treated with NPH insulin. In addition, we demonstrated a significant reduction of lean body mass and a non-significant reduction of extracellular fluid volume after 8 weeks, as well as a non-significant transient increase of urinary sodium excretion in the first days of insulin detemir treatment. The weight reduction observed after 8 weeks of treatment with insulin detemir is in accordance with previous observations [1, 2]. However, the weight reduction of the same magnitude seen within 1 week of initiating insulin detemir is new and surprising. The reduced lean body mass and extracellular volume after insulin detemir treatment support the idea that insulin detemir exerts its initial effect on body weight, at least in part, by a reduced tendency to fluid retention compared with NPH insulin. This hypothesis is further supported by our demonstration of a (probably) transient increase in urinary sodium excretion in the first days after initiating insulin detemir treatment. The changes in fluid homeostasis, although small, were not associated with changes in blood pressure. Blood pressure was measured meticulously by 24 h measurements, conducted by patients at home, and we speculate that small changes in fluid volume are accompanied by regulatory mechanisms that attempt to keep blood pressure constant. Blood pressure was unchanged in the first week, and this might be explained by the time-point of blood pressure measurement, namely before and after the transient increase in urinary sodium excretion, thereby missing the time when a short decline in blood pressure might have been detected. Moreover, as patients were studied in the 1st week after the change in therapy, we cannot rule out some degree of carry-over effect of these intermediate-acting insulins. On the other hand, it has recently been demonstrated that glitazones, which significantly induced sodium retention, also did so without changing blood pressure . We found a small, but significant increase in HbA1c and a slight increase in insulin dose during treatment with insulin detemir. It is possible that the difference in metabolic control could, at least in part, explain the reduced fluid volume observed during insulin detemir treatment. However, it seems unlikely that a difference of 0.6% in HbA1c would have any urinary osmotic effect, and indeed, we found no difference in urine volumes in the first days of the two treatments . Moreover, mean blood glucose was similar in the 1st week of the two treatments, where the weight loss with insulin detemir occurred, another argument against the proposal above. In conclusion, we found that insulin detemir had a weight-sparing effect compared with NPH insulin in normo-albuminuric type 2 diabetic patients. The effect was apparent after as early as 1 week of treatment, when a transient, although non-significant, increase in urinary sodium excretion was also demonstrated. Together with the reduction in extracellular fluid volume, these results support the idea that the reduced weight gain observed during insulin detemir treatment is, at least in part, explained by changes in fluid homeostasis. KVH, TJ, BF-R and PO all contributed to the conception and design of the study and contributed to analysis and interpretation of data. All the authors participated in drafting and revising the article and all have approved the final version of the article.